The stockade at Eureka was built on 30 November 1854, and was destroyed during the Eureka Battle on 03 December 1854. 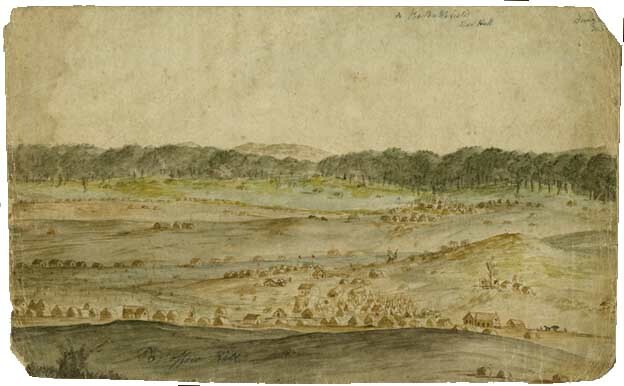 Charles A. Doudiet, The Battlefield - Red Hill (From Post Office Hill), 1854, watercolour, pen and ink on paper. The stockade, a rough barricade, enclosing about an acre of ground, on the Eureka lead, behind where the Orphan Asylum now stands, was made Lalor's headquarters. The barricade was a flimsy affair, constructed of slabs stuck on end, brush wood, and whatever could be obtained handy. It enclosed several tents, stores, and windlass claims, and appears to have been designed to conceal the operations of the head quarters staff rather than as a fort, in spite of Lalor's untiring efforts it it was difficult to enforce discipline. Men came and went freely, and all that happened was known to the commissioner. The diggers knew that another large reinforcement of troops from Melbourne was expected, and they believed they were secure until these arrived. Captain Thomas, the officer in command of the military forces at the camp, realising that the diggers had been lulled into a false sense of security resolved on a surprise attack. On Sunday morning, December 3rd, just before daybreak, he led out his men (276) and stole silently to the gully between Cattle Yard Hill and the hill which Rodier-street now bisects, and wheeled round on the stockade, near the Free Trade Hotel, which was kept by Lester (afterwards of Lester's Hotel Sturt street). It was bright moonlight, and just breaking dawn Lalor's pickets sighted the red coats, and fired, and were answered by a volley from the troops. It is generally agreed there were not more than 300 men in the stockade at the time. Many of these were asleep. Numbers had only the clumsy pikes for arms. A few volleys and then the charge, and tee barricade fell like a pack of cards, and the fight was over in 25 or 30 minutes from the time the first shot was fired. Fourteen of the diggers were killed outright, or subsequently died of their wounds, and 12 others were wounded, and a great batch of prisoners were taken. Lalor had his left arm smashed with a bullet. He was hidden under a pile of slabs, and escaped. Some days later his arm was amputated, and he was conveyed to Geelong, and kept in hiding until a general pardon was granted to those who had taken part in the episode. Two hundred pounds reward was offered for Lalor and the same amount for Black, and £500 for Vern who was concealed for week's in a diggers tent near Eureka. The loyalty of the digger's was such that none of the leaders were betrayed. Captain Wise, second in command of the soldiers, was killed by one of the first shots fired from the stockade. Three privates were also killed, while several were badly wounded, one subsequently dying. The diggers were buried in one grave in the old Ballarat Cemetery, and a monument, presented by Mr. James Leggatt, of Geelong, erected over it in 1836. The soldiers were buried in the same cemetery close by, and the Victorian Government erected a monument to mark their grave in 1879. Her Majesty's forces were this morning fired upon by a large number of evil disposed persons of various nations, who had entrenched themselves in a stockade on the Eureka, and some officers and men killed or wounded. Several of the rioters have paid the penalty of their crimes, and a large number are in custody. ↑ The Argus, 19 December 1854. ↑ Adelaide Advertiser, 3 December 1904.